This post brought to you by the 2005 Cream Reunion Concert...Clapton playing the same as 40 years earlier?? I like a lot of this, other than Mauer. He's done, imo. Thanks! No 10 year contracts to anyone! The only way the Twins will ever land a FA like Machado is if we egregiously overpay. It ain't my money ... DO IT!!! I’ve actually made similar comments. I think it would take 3-4 pieces but that the pieces are large and costly. I think they could do this and still have a reasonable payroll. But if I’m Machado, I’m not sure the money is what signs him and I think it would take more than 30mil/yr. and I don’t see this FO/owner okaying a 10 yr contract. But, I still think this is very doable without completely bloating payroll a la the Yankees. But, I still think this is very doable without completely bloating payroll a la the Yankees. 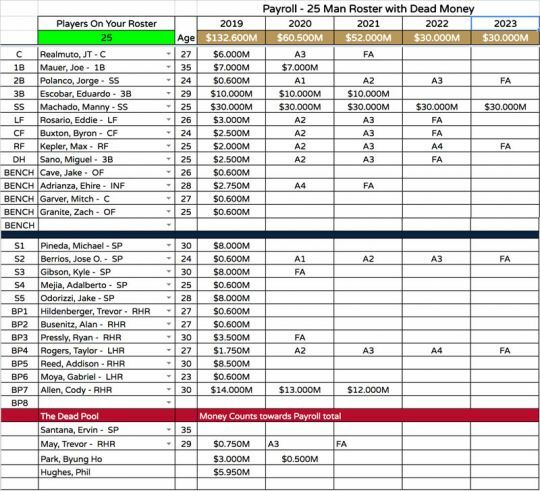 Looking at the chart, I'd guess the "payroll bloat" would start in 2020 trying to re-stock the starting rotation.Would definitely need Romero, Gonsalves, et al to eat up some of those spots. I think it is pretty likely the Indians resign or QO Cody Allen. He’s one of the only good relievers they have. And Miller is a FA. This was fun - great work! 1. I don't trust the owners to get to the 132 million you want. 2. I'm not spending 25% of my budget on one player.That's asking for clubhouse issues at some point.It isn't fantasy baseball to the Twins. 3. No 10 year contracts period. 4. I'm not trading Romero for a catcher. 5. The pitching isn't good enough to make it past the central.Besides Berrios, not one starter is a guywho can win in the playoffs. 6. Cleveland is going to resign Allen.Maybe you can find a closer. 7. No bench bat.If you have Cave, you don't need Granite. Regardless of my disagreements, it was a fun read. Machado is a pipe dream but it's a good pipe dream. Amazing how much better he makes our lineup. My guess is the FO isn't going to make these sort of longterm plans until they see more of what they have in Sano and Buxton. If they can come back after the all-star break and put up a decent August/Sept run and give the FO reason to think they can be counted on for a full season, I think they might make those sort of aggressive moves. But I think it's unlikely that they would do so and we're more likely to see payroll drop to the bottom 7 or 8 team range. Excellent work! Thanks for pulling this together! Why would the Twins pay Mauer $7 mil to hit 8th in likely fewer than 120 games? That is not wise usage of limited payroll dollars or limited roster spots nor does it maximize talent. Mauer has one season since 2013 with an OPS over .752. It seems hypocritcal to me when some criticize the FO for foolish spending on retreads or washed up vets but yet are willing to fork over almost double the avg MLB salary to a guy that has averaged barely 2 bWAR the last 5 seasons. It is time for Mauer to retire IMO. If he doesn’t feel that way, I suspect he will after all the offers he doesn’t get this offseason. There simply is no spot on the modern roster for a part time player that doesn’t produce. No way any other team gives him $7 mil per year. To do what? Odds are most every team already has a better first baseman/DH at the MLB level or one chomping at the bit or both. Edited by ChrisKnutson, 12 July 2018 - 11:28 AM. "Quick fix" sign one of the best players in baseball and trade for the best catcher in baseball, easy! 4 of their probably Top-10 prospects for 2 years of control on a catcher? Sano for an unproven bullpen arm with questionable control? Also, as much as I'd love Machado, $200 million over 8 years isn't going to get the job done. - Remember, not all prospects are a given, so we shouldn’t be afraid to make a deal for the best catcher in baseball. The only “untouchables” should be Lewis, Romero, Graterol, and Kirilloff. - Also, I believe this team can win with or without Sano in the lineup, so if we can get someone (or prospects) just as talented, I’d say go for it, because I just think a change of scenery would be best for the team and Sano himself. - I’m guessing we will see how much Machado values playing SS, because most of his “likely destinations” would rather play him at 3rd, so maybe he takes a “discount” of 200 million to play SS everyday. But if not, then I’d be more than ok with going all in on Manny, by making him our only free agent signing in the offseason. Edited by ChrisKnutson, 12 July 2018 - 12:31 PM. It worked for NYY throughout the 90s.